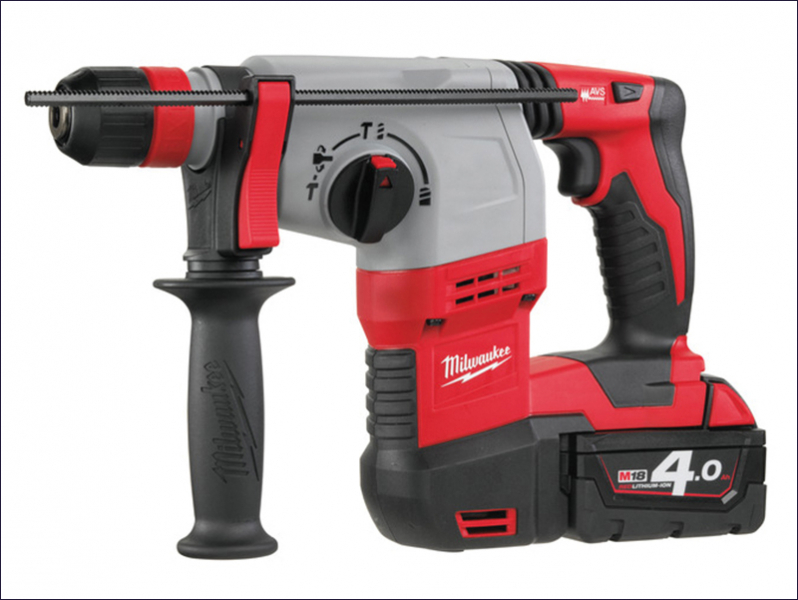 The Milwaukee HD18 HX M18™ compact cordless 18 Volt 3-mode SDS hammer drill has a high powered motor which gives corded tool performance. It has a 4-mode operation: rotary hammer, hammer only, rotation only and variolock for maximum versatility (Variolock and hammer stop function). With FIXTEC system for keyless chuck changing and a mechanical clutch which protects the tool when bit binds up. The HD18 also has AVS (Anti-Vibration-System) to deliver maximum comfort by minimizing vibration, and a powerful hammer mechanism to deliver 2.4 Joules of impact energy. REDLINK™ overload protection electronics in tool and battery pack deliver excellent system durability. An all metal gear case allows for optimum seating of the gears for enhanced service life. Mode: Rotary Hammer, Hammer Only, Rotation Only. Impacts Per Min: 4,200/min, with 2.4 Joules. Capacity: Wood: 30mm. Steel: 13mm. Concrete: 24mm. Supplied with 2 x 4.0Ah Li-Ion batteries, charger, and kit box.